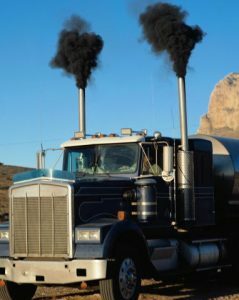 On Friday, the South Coast Air Quality Management District (SCAQMD) took an important step toward cleaning up the freight industry in Southern California. In a highly anticipated vote that had been delayed for months, the Governing Board directed its staff to go ahead with drafting regulations for limiting emissions from railyards and warehouses. The Board, including Coalition for Clean Air President Joe Lyou, who is the Governor’s representative to the body, took separate votes on whether to implement Indirect Source Rules on five different types of freight facilities. The Governing Board voted overwhelmingly to oppose moving forward with direct regulations on marine ports, airports, and future major development projects. They voted narrowly, but successfully, to begin crafting regulations for railyards and warehouses, which remain large sources of pollution for the smoggiest air basin in the country. The region is under intense pressure to come into attainment with federal clean air standards, and Indirect Source Rules will be an important tool in that ongoing challenge. Both railyards and warehouses are often located near homes. For residents that live along the highways that originate at the Ports of Los Angeles and Long Beach, the new warehouses that are being built by the week pose threats to their health and quality of life. In many cases these facilities can bring thousands of trucks per day into previously quiet neighborhoods. An Indirect Source Rule can, if implemented properly, provide protections for these residents, and forge a path toward cleaner air. “We have to keep our focus on the job in front of us. We need 45% NOx emission reductions within 5 years. 45%. As of today, I don’t see us getting there. If we don’t, we face 2 to 1 offset requirements, which will be a de facto ban on new businesses or the expansion of existing businesses, we face the loss of billions of dollars in federal highway funds, and we face a federal takeover of our air quality regulatory program. The last time that happened, EPA proposed no drive days. The next time it happens, my guess is that they propose to close the ports for 3 to 4 days a week. I’ve said it before and I’ll say it again. In the long term, the worst thing for business is non-attainment. So, first and foremost, let’s stay focused on 45% NOx emission reductions within the next 5 years. That means we have to secure all of the NOx emission reductions we can as quickly as we can. Second, we have to look at what the law requires. California law clearly says that we have to adopt every feasible measure to get us to clean air as expeditiously as possible. Others have already proven that indirect source review rules are feasible measures. The fact is that we’ve been skirting the law and it has to stop. Third, and this is more of an issue of strategy than air quality, but – even if we decide to enter into voluntary agreements – I have to question why we would take anything off the table before we have secured those agreements. How can we expect staff to bring us meaningful and effective agreements if we send them into the negotiations with their hands tied behind their backs? Taking ISR off the table takes away the leverage our staff needs to negotiate good agreements. Why would we do that? Fourth and finally, it seems to me that a lot of the problem here is that a lot of the disagreements among people may well be due to the fact that we don’t actually know what’s being proposed. If we had gone through the rule development process and had the proposals before us, we may find that we actually don’t disagree as much as we think we do. Based on my experience, I am confident that our staff would develop reasonable proposals that balance our air quality needs with economic impacts and practical issues. Some ISR requirements may be as simple as providing electric vehicle charging stations for employee parking, or putting solar panels on new warehouse developments where the roofs are designed for that purpose. It doesn’t have to be the end of the world. The San Joaquin Valley has had an indirect source rule in place for 12 years. It hasn’t prevented warehouse development. In fact, warehouse growth in the San Joaquin Valley has increased dramatically. I trust that we would develop reasonable ISR rules that make accommodations where necessary, such as housing. I support directing staff to consider exemptions for low-income housing developments, transit-oriented development, and other housing proposals that don’t involve suburban sprawl. Those types of projects help reduce vehicle miles traveled while addressing our housing shortage, which is a win-win. I also agree with staff about airports. I don’t think we’re going to need ISR regulations to get the NOx emission reductions not already covered by other rules. If they don’t come to the table, we may need to reconsider but for now, working on voluntary agreements makes sense when it comes to airports. In the end, this is a bell weather moment. It’s less a question about whether we adopt new regulations and more a question about who we are as an agency. We’re already behind the San Joaquin Valley when it comes to new development projects. Are we still the air quality leader we claim to be? Are we willing to make tough choices – the right choices – knowing that we will be criticized for doing so, because that is true leadership. Or do we lack the courage to use all of the authority vested in us to get to clean air, and the responsibility we share to protect the health of the 17 million residents who live in our district? This entry was posted in Clean Air, Climate Equity, Freight, Port & Freight and tagged air pollution, freight, goods movement, warehouse. As a person who lives in the CA’s Central Valley, I support any effort to cleaning up the air in this area. Too many children and too many adults needlessly suffer from asthma due to the terrible bad air. Thank you for taking action against anyone who wants to squash any air cleaning initiative. Whether or not an Indirect Source Rule will make a difference in reducing emissions- only time will tell. But in the meantime, I was struck by the statement that SoCal needs 45% reduction in NOx emissions in 5 years! So. Cal could achieve more bang for the buck –i.e. more NOx reductions — by getting truckers into the newest generation of diesel trucks. But CARB’s Truck rule ensures that for 5 more years the oldest commercial trucks will continue to stay on the road until they can no longer legally be registered in CA. CARB ‘s choices for investment of the $423 M in VW Settlement funds for NOx mitigation go to the technologies least available in scale to achieve it. Electrification desires of CA are well known, but CARB is taking the wrong approach in the VW Settlement by placing more funds for future technologies than those here today that could start making a dent in the NOX emissions at a speed and scale that is needed. Instead, CARB sets aside more in administrative reserve than it choses to actively invest in replacing older diesel engines and equipment with newer versions. The newest generation of diesel truck engines can and do achieve near zero emissions of NOx, and are available today, and would go a lot farther toward reducing NOx faster in 5 years than other approaches.